I love the American Southwest and for escapism fiction, I must confess that I have a sort of closet interest in reading what is popularly termed ‘westerns.’ But I also have to admit that I haven’t read a wide variety of authors and I’m not particularly well-versed in who’s who in westerns. So when I saw this book available I initially thought this was a self-published book. What a surprise to learn that Giles Tippette wrote a good number of books in the 1980’s through the 1990’s. The Bank Robber tells the story of Wilson Young, a young man who came out of the Civil War with no job to go back to and his land stolen out from under him. In order to survive, Young looks for a means to get money. Since what he knows how to do best is hold a gun. So what sounds like an easier job than robbing banks? As the book opens, Young and two others are robbing a bank, but one of the trio has a bit of a hot-head and is ready to shoot an employee, but Young stops it with a threat. On their get-away, heading to Mexico, they lose a horse (and the money) in a river. Young isn’t very happy with his associates, who he sees as bunglers. He tries to make his way into Mexico, passing himself of as a horse dealer. Les nor I didn’t say anything. And in the plotting, past portions of the book are completely ignored to plow ahead. As the book is winding down, Wilson has become interested in the daughter of a Mexican rancher. He says, “All I knew was that she hadn’t been out of my mind for fifteen minutes ever since I’d seen her.” And yet, only a few pages prior to this he mentions that he hadn’t realized how much he liked her until he got back to the ranch. And was there ever any mention of his thinking about her? Not until he says he couldn’t stop. It’s a fairly quick read and the character of Wilson Young makes this worth considering, but it’s clear why I hadn’t heard of author Giles Tippette before, despite having spent a bit of time browsing the “westerns” aisle of used book shops. Looking for a good book? 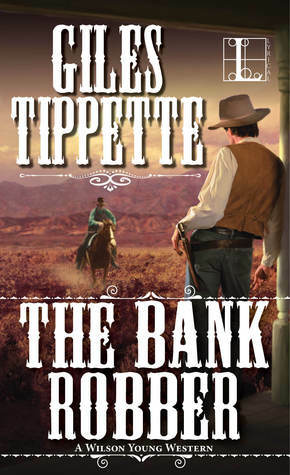 The Bank Robber, by Giles Tippette is a quick read with an intriguing main character but the story itself is on the weak side.